Join me Tuesday, November 22nd, for another live and interactive FutureofEducation.com webinar with Scott Nine, the Executive Director of IDEA, the Institute for Democratic Education in America. IDEA is a national effort "to unite education with our nation’s democratic values" and they believe that "young people ought to be active co-creators of their own learning and valued participants in a vibrant learning community." We'll talk about democractic education, building momentum for education change, and where and how he sees healthy change in education coming. Recordings: The full Blackboard Collaborate recording is at https://sas.elluminate.com/p.jnlp?psid=2011-11-22.1722.M.9E9FE58134BE68C3B413F24B3586CF.vcr&sid=2008350 and a portable .mp3 audio recording is at http://audio.edtechlive.com/foe/scottnine.mp3. Scott Nine is the Executive Director of IDEA. A dynamic public speaker and organizer, he enjoys teaching and learning about leadership, social justice, community, educational reform, environmental sanity, personal growth, entrepreneurship, and how we get along with one another. Scott has a Masters Degree in Social Work from Arizona State University. 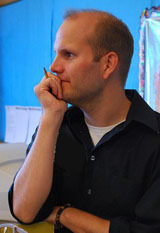 He has experience teaching, advising, and creating learning communities for people ages 5 to 95. Raised by two public school educators, Scott fell in love with his partner Hollie while growing up in Apache Junction, Arizona. He lives in Portland, Oregon where Kristofer, KD, and Ellanore teach him new lessons on an almost daily basis. "IDEA is committed to bridging the disconnect between our democratic values and the way we educate and treat young people. This disconnect is striking, as the learning experience today is largely determined by a standardized, high-stakes, and de-personalized approach that alienates young people from learning and drives gifted teachers out of the profession. "IDEA defines democratic education as learning that equips every human being to participate fully in a healthy democracy. We believe that in a democracy based on participation of each individual, education should also be democratic. "IDEA collaborates with communities around the country to reclaim and reinvent education, in ways that develop compassionate citizens and changemakers."